Why Use Pine Straw Mulch? 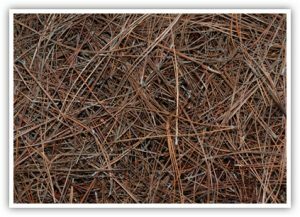 Pine straw comes from several different species of pine trees, which drop their needles naturally throughout the year. Each species’ straw has its own unique characteristics such as needle length, wax content, and needle flexibility. Once the straw drops to the ground, harvesting begins without damage to a single tree. Why Is Pine Straw Mulch So Great? Pine straw mulch is considered a renewable resource, reproducing its needles over and over again. Pine straw may also hinder the establishment of weeds and soil-borne diseases. Because pine needles interlock even on landscapes with considerable slopes, pine straw is unlikely to wash away. At the same time, pine straw remains loose and does not form a top crust like other mulches. Loose mulches such as pine straw allow water to drain readily into the soil for plant availability avoiding wasteful irrigation runoff. In short, it’s an excellent tool for landscape maintenance and lawn care! Also, the fine texture and uniform color of pine straw is simply more aesthetically pleasing to some. The attractive, earthy tone brings out the color, contrast, and texture of your landscapes. Besides being produced naturally, there are a variety of health and aesthetic advantages for landscapers to use pine needle mulch. landscape. Eliminates erosion caused by wind and rain. Protects against soil compaction by reducing the rain impact directly on the surface. Promotes favorable soil tilth for healthy root growth. Does not require removal. To revitalize the color, simply add a layer of fresh straw on top of the old straw. At WeedPro® Lawn Care, no job is too big or too small. Our long list of satisfied customers includes homeowners’ associations, private home owners, apartment complexes, condominium communities, shopping centers, office parks, and churches. Whether you need a trailer full of pine straw or a mulch pathway for your home, we can meet your ground cover needs. If you’re looking for pine needles for sale that make and excellent mulch, contact WeedPro!